Lock app in Slide App is useful to get student's answer to additional questions in different modes. There are four different types of the lock which you may choose from. The student will need to answer the lock on the slide correctly before proceeds to the next slide or Activity. This lock app will help to prevent the student from carelessly going through the material on the slide. In configuring the locks in Slide App, you may pose the question or hint to the password in the given space box. Text lock works well for passwords such as keyword. It accepts alphabets, symbols, and space and it is not case-sensitive. Voice lock works with Chrome browsers only. The student will use their voice to read out the password to open the lock. Numbers lock can be used for simple Mathematics question such as 4 + 2. The password for this lock can be in decimal number. Direction lock is useful for orientation password. This lock can be viewed as such; ↑ means upward or north. Treasure Key lock requires students to collect a Treasure Key with a matching Key ID to unlock the lock. This works well if you want students to go through a certain difficult activity that was on a divergent path before unlocking the next activity. 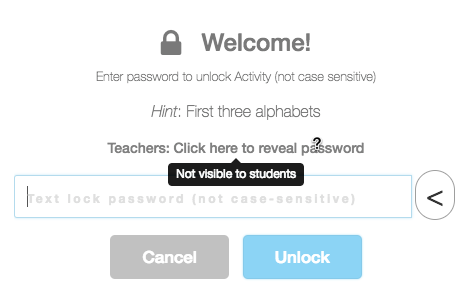 By logging in as a Teacher, you will be able to reveal passwords for all Locks including decks shared by other teachers. If you have not, you may sign up as a Teacher at https://deck.toys/getstarted. Do you know about the lock on Activity? Find out more here.